Bishop’s Bread – a Christmas keeper – and this is NOT fruitcake! Posted in Breads, on December 3rd, 2007. I’ve been waiting for months and months to give you this recipe. Since I only make this at Christmas-time, I didn’t think it appropriate to share it when the temps outside were in the 90’s. Although this is not my original recipe, I will tell you I’ve been making this for about 40 years, and this is one of those recipes – if you’re a regular reader of my blog – that I say – “now, listen up! I’m about to share something important.” Hence it is. Important. My mother’s friend Mary gave me this recipe, back in about 1969 or 1970. We had a group of us – 4 women: my mother, Fay, and two of her friends, Esther and Mary, both near her age. And me. We played the Japanese version of Mah Jong about every 2 weeks or so, and one of us provided lunch. It had to coincide with when my daughter, Dana, went down for her nap, so more often than not, it was at my house. After eating the repast we’d then play the game for a couple of hours. • I do like maraschino cherries. Certainly I don’t eat them 11 months of the year. I mean, where do we ever even SEE maraschino cherries anymore except on some caterer’s platter or in a Shirley Temple. I went through a stage in the 1970’s when red dye was an anathema, but that didn’t keep me from making bishop’s bread, I’m sorry to say. So much for my dedication to the shrine of a healthy body! But now they don’t use the bad red dye (supposedly), so I hope that since this is only consumed by me for these few, short weeks, maybe I’ll live another day. • And, I like chocolate too. You all already know that. You can use Nestle’s chips, or cut up your own, or use some other brand. The better the brand the better the bread. You could use milk chocolate too, I suppose. • And, I like walnuts. • But, I don’t like fruitcake. • Enter, ta da: Bishop’s Bread! So, on to this recipe. If you’re going to be a stickler for detail, I suppose this does bear some resemblance to fruitcake – it has a similar consistency – chunks of goodies glued together with a basic cake recipe. Kind of like pound cake. But, instead of citron and dried fruit (lemon, lime, orange, red candied cherries, dates, figs, etc) this has nothing but chocolate chips, walnuts and maraschino cherries. The cherries maintain their moistness, and you combine them with walnuts and chocolate, and it’s a marriage made in heaven, I say. Yes, it’s a bread-like shape, and you slice it like fruitcake, but it isn’t. I promise. On my honor. There’s the walnuts, chocolate chips and masarschino cherries all mixed with all the dry ingredients (flour, baking powder and salt). The sugar goes into the egg mixture, which is added next. You add in the eggs and sugar mixture to the dry ingredients. Stir with a spatula until everything is well coated AND you can’t see any white flour bits anywhere. There they are, just baked and cooled. They make lovely gifts for people at this time of year. You can bake it in bread pans, so you’ll have just one loaf using the recipe below. Or, if you’re a Bishop’s Bread lover, then you bake in large quantity. Today I made a quadruple batch. It would make 4 bread pans full, but I had some smaller, cute little cardboard ones that are perfect for giving away (picture above). I made seven of them and one loaf pan. I’ll keep the loaf sized one and very judiciously give away the others. Only to very special friends. You can interchange nuts if you’d prefer something different. And if you don’t like maraschino, then substitute apricots, perhaps, or dried cranberries maybe. But it won’t be the same. It probably did have candied cherries in it at one time. Whatever it is, I adore this bread. And if you’re a regular reader of my blog, and you like my recipes, then I sincerely request that you make this bread. Post Haste. NOTES: You could also make these in smaller pans (and bake a shorter time) and give as gifts to friends and neighbors. The proportion of nuts, chips and cherries can vary to your taste. If you don’t like maraschino cherries, substitute dried cranberries, for instance. Prefer pecans? Or maybe macadamia nuts? The original recipe I was given also included dates. 1. Preheat oven to 350°F. Grease a bread pan and line the bottom with waxed paper (yes, it’s important). Sift dry ingredients (this is to make certain the baking powder and salt are evenly distributed) into a large bowl. Add chocolate chips, walnuts and cherries and stir to coat the items, particularly the cherries. Per Serving: 255 Calories; 13g Fat (42.8% calories from fat); 6g Protein; 33g Carbohydrate; 2g Dietary Fiber; 32mg Cholesterol; 82mg Sodium. I cannot get over this recipe…it sounds like the perfect dessert for Christmas. It also seems versatile and I am seriously wondering how this would be in a simple trifle – layered with some vanilla pudding in a trifle bowl and then topped with chocolate shavings. Or would this pair better with ice cream? Thoughts? I am scheduled to make a trifle for Christmas day and want to break away from my usual…would this work? Hmmm. I don’t know about the trifle idea. If you can picture using a dense kind of bread (well, like date nut bread, for instance), that kind of heaviness, then it might work. If you sliced the bishop’s bread quite thin it might work. And I wouldn’t make the vanilla pudding/sauce all that sweet – under sweeten it, I’d think. You could always add more sugar later if you took a taste of the bread with the pudding. And some whipped cream to cut the richness? Just a thought. This bread is the best!!! I am so lucky to be a recipient of the few loaves my mom makes, I wish I had taken two loaves. This is the best. I don’t like fruitcake either. This is a great recipe. I served it recently and got rave reviews. It looks so pretty thinly sliced on a Christmassy plate. If you have any left overs, it stays moist for quite awhile. So make sure to save some for yourself!! I still have one loaf left. I think I’ll keep it hidden in the refrigerator until awhile after Christmas. I’m already on food overload with the parties, dinners, etc. we’ve been going to. But I agree, it’s good stuff! You don’t always have to make it as an actual bread loaf shape. My mother has been placing the batter in cupcake tins for years. It cooks faster and is perfectly portioned. I want to just add a memory to this bishops bread. My mother made it when I was a kid.. however she did something I have done and works quite well. She would make hers in a 9×13 pan and sprinkle white sugar on the bottom of her pan after she greased it. she would rinse her cherries and place them accordingly. Then pour her batter which only carried flecks of the cherries and nuts in her batter. When she flipped the bread after it was cooled the sugar sparkled like glitter..very pretty and impressive. I now do this with my loaf pans.. I also chop my cherries and chocolate and nuts very fine and only put a small amount in the batter.. it looks so pretty when you cut it and still very good..the larger fruit and nuts are all at the bottom of the pan and its in the flipping that you get the right effect.. try it, you might like it too! I have loved and made Bishop’s Bread for years, for my family and for presents. It’s a universal hit. For a fictionalized biography of Katherne Swynford, one of my all time favorite books is “Katherine” by Anya Seton. It’s very well researched and well crafted for historical fiction of the 1950s. It was reprinted in 2004. I highly recommend it. I have been making this bread for many, many years. I received the recipe from a neighbor (currently 96 years old). This recipe calls for dates, walnuts, brazil nuts. We also put in red and green maraschino cherries with the juice. This neighbor of mine told me that her ancestors told her that in the 1300’s this bread was made special for when the Bishop of the Catholic church would come for a visit. He was the only one who could eat of it. Eventually as time went on, other church officials were allowed to eat it. This day and age, everyone gets to eat it no matter what religion you are. It originated in Germany. I am sure there could be a lot of truth to this. I was reading “Pat of Silverbush” written in the 30’s and your recipe came up in a search. I now must try it! My grandmother and mother have been making Bishop’s Bread for YEARS!!! It is a great recipe and a huge surprise to anyone and every one who tries it. I use pecans rather than walnuts (more flavor! )and half the amount of cherries (other half dates); OTHERWISE, STICK TO THE RECIPE. Surprise your friends and family!!! I got a similar recipe from a friend’s Mom over 25 years ago and I make it every Christmas. Everyone loves it. There a 2 differences. The first – use candied cherries instead of marashino. Also, when cooling the loaves, put the tines of a fork into the loaf in about 6 or 7 spots about a 1/2 inch down. Then spoon over the brandy over those spots. Help -I made this but it was so thick and dense that it broke apart -do I need to add some more liquid due to our altitude?? I live at 5280 ft. Still tasted great. Thanks. My mother made this Bishop’s Bread every Christmas and I helped from the time I was about 5 or 6. I am now 65 yrs ago. I am not motivated to make it but sure would love to taste it just once!! Does anyone volunteer to make one large loaf and send it to me? I have paypal and would pay for the labor and ingredients. Thank you. I got my Bishop’s Bread recipe from a co-worker who brought it to work every December. My recipe includes chopped dates. It is my husband’s favorite Christmas cookie. They make this bread in the cutest ABC Family Christmas movie (12 Dates of Christmas) and call it cherry chip loaf. I looked all over the internet for a recipe for cherry chip loaf and this looks perfect. Besides the fact that I’m pretty sure I didn’t cook it quite long enough, it turned out great. It is so good! Thank you for sharing a bit of the history and the real name. Is there no shortening in this bread? With 3 eggs, it shouldn’t be dry, but you can never tell! Hi Carolyn… looks yummy. Going to try it this weekend. Noticed the recipe does have baking powder. So, should I use plain flour or is it ok to use AP or whatever I have on hand? Always look forward to your post. Thanks. Hi Carolyn, I came across your blog this past Thanksgiving because I misplaced my recipe card for bishop’s bread, and it was too late at night to call an aunt for it. Our family has made bishop’s bread for years, passed down by my Granny, Helen. She told us that she had come up with the recipe by accident, I’m not sure what year exactly but it would’ve been sometime in the 50’s- early 60’s, when she was living in the Chicago area. She was baking a batch of fruitcake, when she inadvertently switched to another recipe, which happened to be for a chocolate chip quickbread. It was a hit with the kids, so she documented the hybrid recipe and dubbed it Bishop’s Bread. Her version was made with fruitcake components, the recipe we pass along in the family has the same quantities you have here except that she used just says 5 cups of mixed fruit and nut- i esp. like to use (dried/plumped in brandy) apricot, cranberries etc with chopped walnuts and pecans. We all traditionally make it on Thanksgiving, and I like to make it for Christmas too. I plan to make your version of this recipe this Christmas season. My Granny was an amazing and beautiful lady and it’s so wonderful to see how far her legacy has reached. God Bless! My grandmother got this recipe sometime around 1910 from one of her Swedish neighbors. She, and then my mother, made this every Christmas and it was always a hit. Her recipe uses red and green candied cherries and chopped dates. It was only made at Christmas time because the candied cherries were expensive and could only be found in stores around the holidays. You should warn your readers that this is a very stiff dough. It contains almost no liquid ingredients (no oil, butter, milk, water etc) except for the eggs. It’s not the kind of quick bread dough that can be poured into the loaf pans, it needs to be spooned. Hi, I have loved this bread since 1971 and only make it at Christmas. Sadly no one but me likes it so I have to eat the whole thing by myself…sigh. I lost my recipe last year and I thought just maybe I could find it. Thanks! Thanks! I am ready to make it. our family has also made this for years, passed from my grandmothers family, Huston’s hailing from Allegheny. Like Ann said December 12th; we use green and red candied cherries and the dates and so only make it at Christmas time. 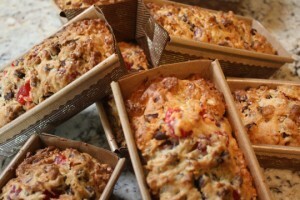 When I make some for gift baskets I will double the batter, tastes as good and makes 3 little loaves. We called it ‘cherry chip bread’ but Bishop bread sounds best, everyone is gone now so no one to ask. Thanks all, enjoy. I made a loaf using my mother’s recipe today and was inspired to google a bit looking for the origin. This site is the first I stumbled on that uses the same basic recipe (I do walnuts, dates, candied cherries (though i’ve also done dried–delicious!). Now that I see all the comments above, I wonder if my family is alone in eating it with cream cheese on it? Just sliced with a layer of plain cream cheese. SO GOOD! Thank you!!! My sister passed last year & I didn’t get her cookbook. Been looking for this recipe for ever. It seems to be the same as she made. Thank you do much for sharing. Thank you for bring back the memory of my sister. She made bishops bread for years and of course I never got the recipe. She has passed away years ago and finding this recipe brings her back to me. I am looking forward to making my first batch today. Thank you again. How many loaves does this recipe make. Assuming one but wanna make sure. I used to make this bread and send it to my husband in 1968 when he was serving with the Marines in Vietnam. What a wonderful find to see it again!